Some students recently had the opportunity to meet the Marines in Plymouth. “We arrived at Stonehouse Barracks at 9:30am for an introductory talk. 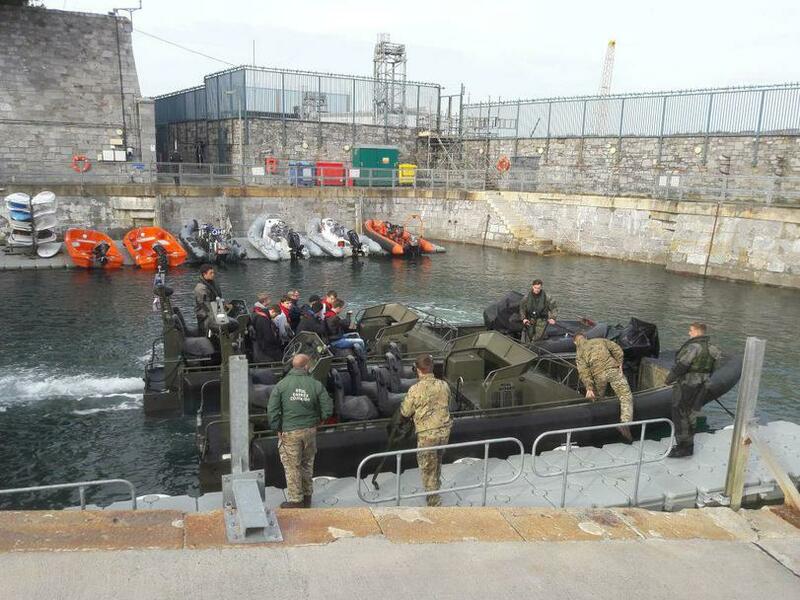 We were then split up into groups to rotate around four activities; a physical training session, abseiling, a static weapon and kit display and rides in an offshore raiding craft before leaving at 3.30pm. I found the day quite a challenge, the PT (Physical Training) was very demanding! They started off making us crawl up a steep hill and then we had to grab a corner of a mat which was really heavy and run with it, we did lunges, burpees, push-ups, sit-ups and squats. We did this on a repeated cycle and we had to lie on our backs with our feet about 6 inches off of the floor. I’m still aching 2 days later! I really enjoyed the boat trip – we went really fast on the river. There were 10 of us in the boat and we got splashed as it bounced up and down and also when it stopped suddenly. “I really enjoyed the boat trip because it was really fast and exciting! We went up and down the estuary and got a great view of the barracks. I found learning about the weapons challenging – remembering the names of all of the weapons was confusing as there is a lot of information that you have to remember, how to set them up and use them.